I recently bought some Numidians from War & Empire (Forged in Battle) , which have managed to get painted extremely quickly - probably due to their simplicity! They are led by some Baueda Generals working in tandem with W&E infantry officers on 40mm round bases for ADLG. I've also posted some comparison shots to show how they scale with other ranges of Romans and Carthaginians (who they will be fighting with or against I suspect). I've just been contacted by a relatively new company, VEPA Figures, who do a small and growing range of 20mm Moderns - so their website has now been added to the 20mm Moderns Directory on this site. That means you can also go to the Directory and rate their figures on a 1-5 scale, and compare them with the other 18 (yes!) metal figure ranges listed there. Italian manufacturer Aquilifer have now been added to the 15mm Renaissance listing, with their range of 12 Scottish and Highlander figure packs. I've just finished pulling together a new Manufacturers Directory, covering the Napoleonic period, and the completed page in all its glory is now up and running on this website via this link. So, if you are looking for 15mm Napoleonic wargaming figures to use for FoG:N, Lasalle, Shako, Piquet, To the Sound of the Guns, Grand Armee, Volley and Bayonet, Empires and Eagles, General de Brigade, L'Empereur, Napoleonic Principles of War, Black Powder or any other Napoleonic ruleset you've come to the right place, as my new 15mm Napoleonic Manufacturers Directory page has information about all of the ranges carried by ALL the 15mm Napoleonic suppliers. Each manufacturers individual listing has details of the nationalities they make, taken from the list of nations explicitly mentioned on their websites - these include: French, British, Prussian, Russian, Austrian, Spanish, Polish (including Grand Duchy of Warsaw), Bavarian, other minor German states (Saxony & Rhine Confederation, Wurttenburg, Hannovarian, Hessian, Saxon, etc) Italian/Neapolitan, Dutch/Belgian, Portuguese, Swedish, Danish, and Turks. Many also have generic equipment and dead and wounded ranges too. For each supplier there is also an indication of whether they are making "15mm" 15mm figures or "18mm" 15mm figures, how they package and sell the figures (singles, packs of 8 etc), details on how you can order from them and a link to their site. There is also a set of new Auction Pages pulling live auction listings from UK eBay for 15mm French, British, Prussian, Russian and Austrian troops if you don't want to paint your own! 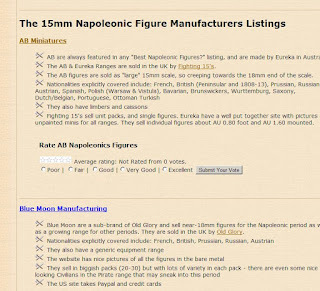 I'm not personally an expert on Napoleonic gaming or indeed the figures so I had some assistance from some of our club members who are - but if there are oddities in the way I have classified and categorized each manufacturers range, please let me know and I can correct them and update the page. Museum Miniatures - 25% Off all Figures, Armies, Equipment and 1/300th WWII aircraft, plus no UK VAT increase. If you know of any more, just drop me an email at the above address and I'll add them to the site. Loads more photos in the Ancients Gallery!